An extensor tendon injury is a cut or tear to one of the extensor tendons. Due to this injury, there is an inability to fully and forcefully extend the wrist and/or fingers. The extensor tendons of the hand are located superficially, so they are very susceptible to injuries. An-other reason is the lack of subcutaneous tissue between the tendons and the overlying skin. Possible mechanisms are sharp object direct lacerations, burns, blunt trauma, bites, crush injuries, avulsions and deep abrasions. Closed injuries arise usually under situations of extreme load. This results in ripping the tendons apart from their attachment of the bone. Dependent on the zone of injury, different characteristics are shown. Zone III: Disruption of the central slip, also called a Boutonnière deformity or jammed finger. This is characterised by a flexed position of the PIP joint and an extension or hyperextension of the DIP joint. Zone V: fight bite injuries (open injuries) or non-fight bite injuries (e.g. blunt trauma): a possible effect of such an injury is a rupture of the sagittal bands, attended with following extensor tendon subluxation. This is presented as a difficulty to actively straighten the flexed MCP joint. Zone VI: the MCP joint can still be extended via the juncturae tendinum. Boutonnière Deformity describes the bent-down (flexed) position of the middle joint of the finger. Boutonniere can happen from a cut or tear of the extensor tendon . Radiographs are recommended because associated injuries of surrounding structures are common. For example, it can be that a piece of bone is pulled off with the tendon. The rupture of the tendon isn’t visible at a radiograph because it’s a soft tissue. Examination of extensor tendon injuries contains different points of interest. First, the wound characteristics should be evaluated e.g.such as size and location to give the physical therapist has an idea of which structures may have been damaged. Next, the function of the fingers and wrist will be tested in three ways: passively, actively and then with resistance. It is important that each finger is tested separately because the juncturae tendinum between the communis tendons can mask a dysfunction. Furthermore, complete neurovascular examinations should be done. Specific for zone III injuries, the Elson test can be used. Static as well as dynamic splinting is used. The mechanism of the dynamic splint is based on the withdraw of elastic bands, in contrast with the static splint where there is no load on the joints. The physiotherapist’s task is to improve the functionality of the hand, with the intention of achieving the pre-injury condition. This will be done by gradually enlarging the range of motion. To reach the best effects, it is necessary adapting the rehabilitation program to the individual. The three most common postoperative treatments are immobilisation, early controlled mobilisation and early active mobilisation. During the first three weeks, the wrist is splinted in at least 21°-45° extension with the MCP joints at 0°-20° flexion and the IP joints in neutral position. This period of immobilisation is followed by passive and active movement of the affected zones. Benefits of this method: a reduction of the risk of rupture, because any load is avoided. Disadvantages: the following rehabilitation can be complicated due to extension lags, extrinsic tightness, adhesions and so on, caused by the immobilisation. A dynamic splint is used, so that the passive motion is caused by the resistance of the elastic bands. Moreover, controlled passive exercises should be done. The patient wears a static splint and in the mean time, active exercises, such as bending and extending the joints should be done. At short notice, early controlled therapy has better outcomes in total active movement and grip strength compared to immobilisation. However, over a longer time frame, both protocols present similar results (Mowlavi et al. 2005). In this study, only the effects on injuries of zones V and VI are explored. Similar effects were found in zones I and II (Soni et al. 2009). Moreover, early active motion provides the same findings as early passive motion. The choice of protocol is based on the patient’s cooperation and on the prognosis. In cases where the patient is motivated to complete the therapy and where a quicker recovery is essential, dynamic mobilisation is preferred. Important to know is that there is a paucity of high-level evidence regarding the management of extensor tendon injuries. As a result, objectively measuring the results isn’t possible. Further investigation is necessary. (Hall, B. et al. 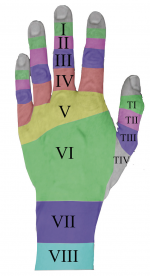 Comparing three postoperative treatment protocols for extensor tendon repair in zones V and VI of the hand: level B).